Sign up for 2018 XMAS project - Quiltmania Inc.
Quiltmania is delighted to offer you a FREE NEW project as you prepare for Christmas! So, gather your woolens, fabrics, buttons, embroidery threads and small accessories to create our special Christmas project. 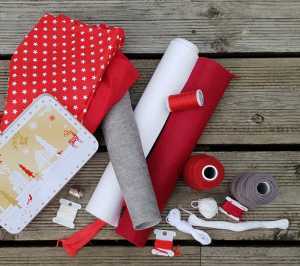 To create our project, Quiltmania has selected 3 colors: red, gray and white; but you are free to choose your palette! Sign up here TODAY to receive information…..starts October 25th! We look forward to seeing your beautiful work! Start NOW by posting your selection of materials using hashtag #XmasbyQuiltmania on social media. Dear Pamela, thank you for your comment. There is no charge, this project is free you just have to register. I’m not sure what I’m doing here, but my choice would be red. We suggest a minimum of 3 colors. i look forward to new Christmas projects. I can’t understand whether this is free or if there is a charge for it. Dear Verna, it’s a free project. You just have to register above. I was unable to confirm as the link was invalid. Dear Barbara, thank you for your comment. You are register!! It worked. This sounds lovely but what does it cost? Dear Linda, Thank your for your comment. This project is free you just have to register above. Free! Oh joy! I love everything that Quiltmania produces.Thank you Carole and your whole staff. Not sure if my enrollment worked so I may be getting back to you. Thank you Sara for such a lovely comment! I tried to confirm that I signed up for for your Christmas offer but the feedback I received said that someone else has that number and I should try signing up again. Not sure how that could be…would you please check that I am enrolled. Thank you so much. What great timing! Was thinking I needed a Christmas project this year. Thank you for your comment! You will enjoy this Christmas project! I WOULD LIKE TO RECEIVE THIS CHRISTMAS PROJECT, BUT WHEN I SUBSCRIBE SAYS THAT MY MAIL IS ALREADY REGISTERED, I DO NOT HAVE ANOTHER, WHAT DO I DO ????? I assume I’m signed up but please confirm. Message back said that my email address already exists. Checked and that is my correct email and should be exclusive to me. Your enrollment worked and your email address is exclusive to you. thank you for such a fun Christmas project to look forward to this year. Thank you Amy for your message and Happy Quilting with Quiltmania!! Just discovered your site and wanted to join. Hopefully I will be able to make a few of these decorations, they are great. Thanks for the connection. Late in but will have a project t for next year. Is there a background d for all of these lovely little squares?